Set on the southwestern tip of the Long Beach Peninsula, Long Beach proclaims itself home to the “World’s Longest Beach” with 28 miles of sand. 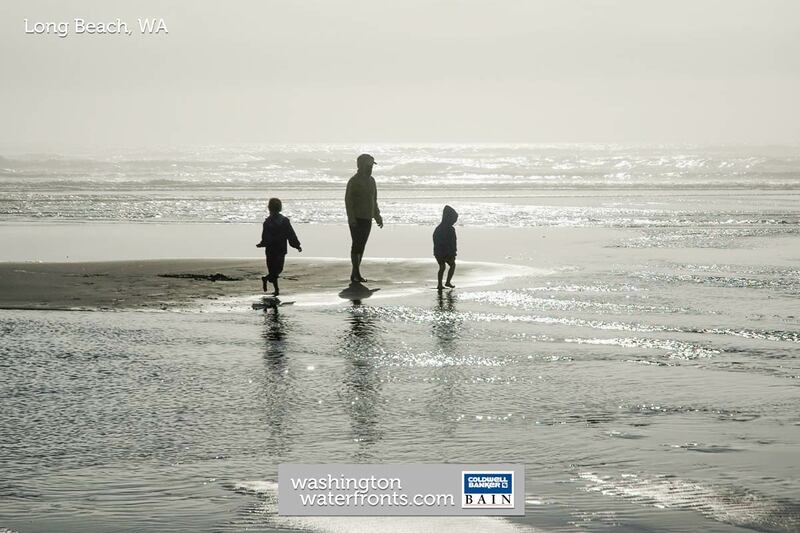 To the west, of course, is the magnificent expanse of the Pacific Ocean, and to the east is Willapa Bay, providing prospective Long Beach waterfront real estate owners with the choice of either oceanfront or bay front property. Either way, owning a waterfront home here means easy or instant access to a host of activities on the sand and on the water, including surfing. If you ever wanted to learn to surf, there is always whitewater for beginners. Fishing, clam digging, sun bathing, beach combing, sandcastle building, and sunset watching are just a few of the fun pastimes here. Long Beach waterfront real estate owners can also look forward to a front row seat for the popular annual Washington State International Kite Festival, held in August every year, as well as year-round access to a variety of entertainment, including carnival rides, games, bumper cars and a carousel, ideal for families with kids as well as those guests who are sure to want to visit. There’s a beautiful, long boardwalk and miles of trails running through the dunes between the water and the town too, perfect for a morning or after dinner stroll. Coastal living can be enjoyed at its finest in Long Beach, with waterfront real estate here often a great value. You’ll find immaculate oceanfront homes that are ideal for a full-time residence or a summer retreat, low-maintenance condos where you can enjoy ocean views from your very own deck and even affordable lakefront homes where you’ll gain private access to both a lake and the Pacific Ocean. No matter which Long Beach waterfront property you choose, if you’re craving the beach life in a convenient urban setting, you’ll find your perfect abode right here on this barely touched peninsula where time seems to stand still. Take advantage of our industry-leading tools to make your property search as easy as possible and be sure to register for a FREE account so that you can receive email alerts whenever new Long Beach waterfront real estate for sale hits the market. If you're seeking to sell your Long Beach waterfront property, contact our Waterfront Specialists directly for a comprehensive listing analysis and to learn more about the cutting-edge marketing strategies we'll use to sell your home quickly for top dollar!